New York City brownstones don’t come any lovelier than 14 and 15 Gramercy Park South, the combined home of The National Arts Club since 1906. Flora, fauna, and other ornamentation decorate the warm, handsome buildings. But why are the heads of five literary giants carved into the facade as well? 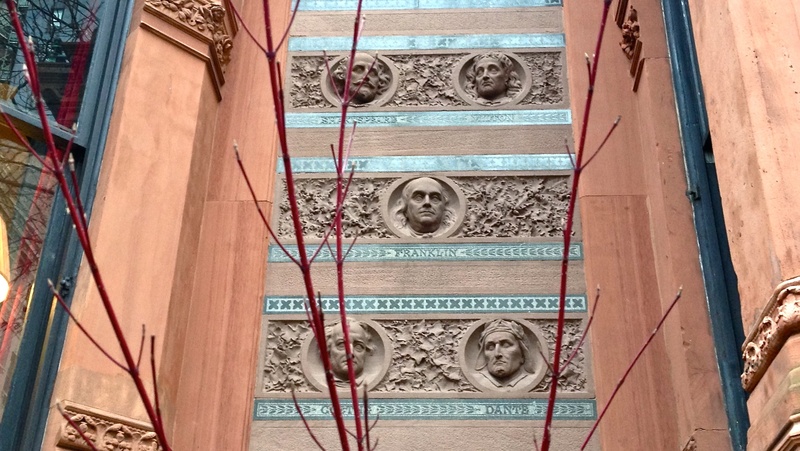 The names are underneath their sculptural busts: Shakespeare, Dante, Franklin, Milton, and Goethe. They were among the authors and thinkers whose books were featured in the library of the brownstones’ Gilded Age owner, former New York State governor and 1876 presidential candidate Samuel Tilden. In the 1870s, Tilden, a wealthy lawyer, commissioned Central Park co-architect Calvert Vaux to combine the two 1840s brownstones into one incredible mansion complete with Gothic Victorian touches, stained glass, and bay windows. After he died, Tilden’s library, as well as his fortune, helped create the New York Public Library. His homage to five literary legends lives on, greeting passersby on one of the prettiest blocks in the city. This entry was posted on December 23, 2013 at 7:05 am and is filed under Gramercy/Murray Hill, Music, art, theater, Poets and writers, Politics. You can follow any responses to this entry through the RSS 2.0 feed. You can leave a response, or trackback from your own site. I love your posts! Thank you! A shame he didn’t specify red terracotta instead of sandstone, back then the stone carvers had a riot over the terracotta coming in due to loss of work, they were not above outright lies and fabrication in their attempts to paint terracotta as a material that would never last In the end as history has proven by 1900- the sandstone was the worst stone imaginable to use for facades, the stone was already coming apart before 1900 on many facades and weathered rapidly, looking like carvings had been made of sugar that got watered down where exposed. As the last 100+ years has proven, the maligned terracotta when properly installed and maintained outlasted the stone and typically looks just as crisp and good as the day it was installed. A walk around the city where ever sandstone was used will show it typically peels off after delaminating in layers, entire faces on keystones would be gone when the grain layers of the stone were placed vertically and perpendicular with the facade. The layers would also split and delaminate when oriented vertically and 90 degrees to the facade too. The white limestone faired much better, but when exposed to the rain and wind it tends to wear down and sharp details are lost as though it’s been sandblasted. Supposedly acid rain and pollutants speed up this process since limestone is highly reactive to even mild acids but some dismiss the acid rain theory for the damage. I’d say within the next 50 years a significant percentage of the remaining and already damaged sandstone carvings will be mostly if not completely destroyed by the continued weathering damage, and the carvings that today have little damage will have at least some additional damage. Many thanks for your detailed explanation of a subject about which I was ignorant. 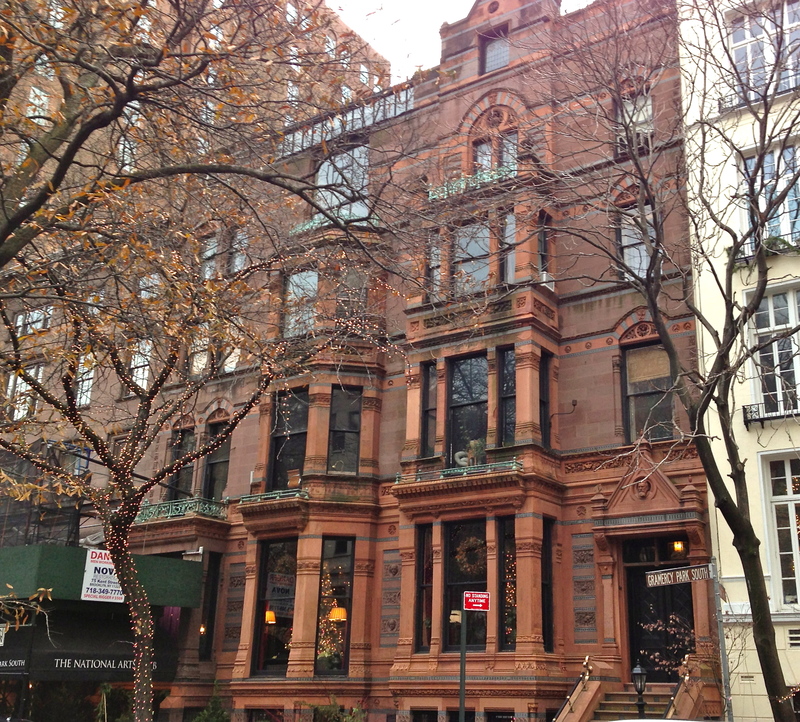 Thanks to you, I have a new appreciation for the use of terracotta in New York’s magnificent Gilded Age architecture! It’s difficult to tell what kind of stone those portrait roundels were carved from- it’s not that course grained red sandstone and it’s not the typical white limestone, it could be those were made from North River (Hudson river today) Bluestone, if so that’s a real fine grained, very smooth high quality stone. Beautiful building and wonderful detail! Just read an article on Tilden’s presidential campaign. He was robbed of the presidency by a corrupt congress. My Dad was a bookkeeper there in the early 70s. I remember a large bronze bust of Beethoven and a wooden phone booth tucked under a stairway… Wish I had appreciated the art more back then. Do you know whose head is carved over the entrance? Thank you.